Yes, you can go to the usual suspects websites and pay $100 or more for business plan software. And they will help you write a nice and polished thirty page business plan with fancy charts and market research galore. The only problem is that it’s a waste of time. The days are long gone when someone actually wants to read such a long business plan. This is the age of Twitter, remember. Over their combined careers, the EZ Numbers team has written and read hundreds of business plans, and we’ve distilled our experience into this expert guide. It walks you step-by-step through writing a great business plan that can be as short as two pages. That’s right, two pages. It’s important to know that you don’t need (and can’t possibly) say everything important about your business in your business plan, the goal is simply to get people to excited enough to want to learn more. The business plan won’t (and legally cannot) get someone to invest. Rather, its purpose is to interest them enough to want to call or meet you. With our outline, you show you how, and give you an example, where the business plan text is just one page. 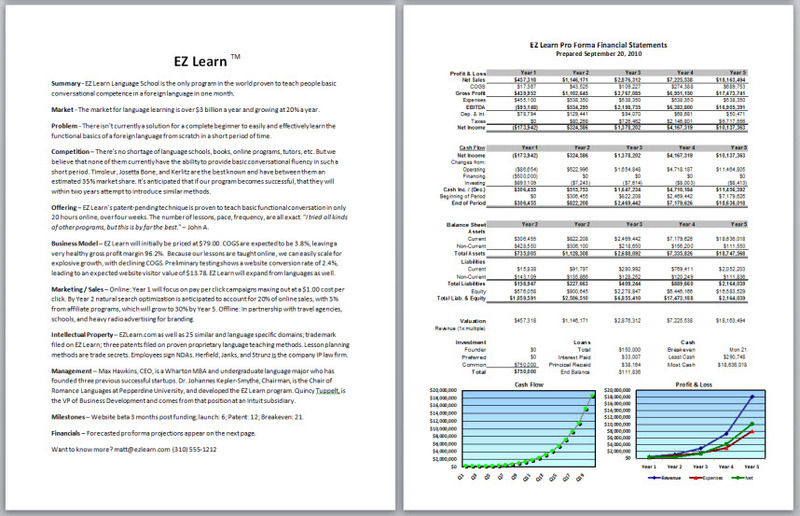 Then the second page is a financial summary, that is created for you automatically in EZ Numbers. And in EZ Numbers you can make the financial report either Portrait format for a document, or Landscape to put in PowerPoint. The reason we give it away for free is that there is nothing magic about it – it’s just a time-tested outline that walks you through the most important things investors and bankers want to know about your business. 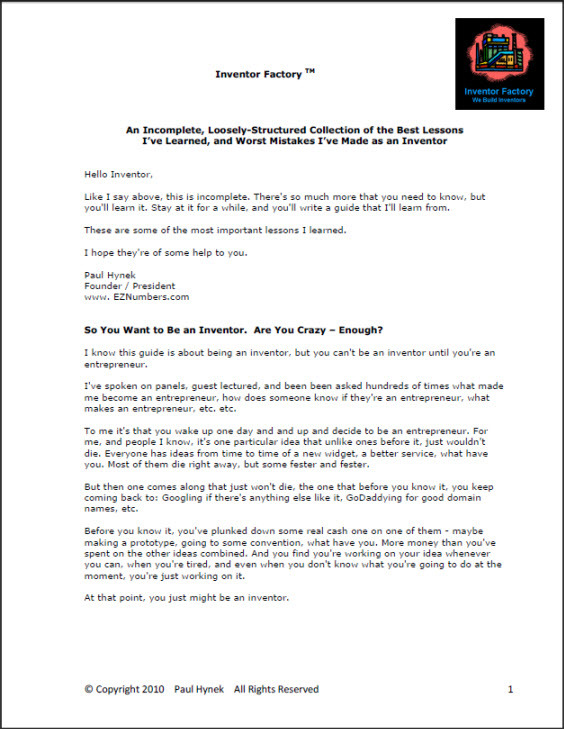 Use the money you would have spent on getting a trademark – and we tell you just how to do that in the Entrepreneur’s Guide to Intellectual Property, Free Bonus #2. Full of war stories, this guide will teach quickly you the basics of copyrights, trademarks, patents and more. It shows you what copyrights, trademarks, and patents protect, and don’t protect, and gives you a primer on when, and how to file them. Take advantage of what we’ve learned over the years. No entrepreneur should be without this. Thinking of manufacturing products? Don’t know where to begin? Inventor Factory is for you. It walks you through how to find, understand, and work with factory owners in China and anywhere else; discusses whether you should license or manufacture your product, how to get distribution, how profitable companies can still go bankrupt, how to choose a business partner, how to finance your company, etc.